Pro Plug PVC Plugging System for AZEK Mahogany Decking - Epoxy Steel - 1050 pcs for 300 Sq. Ft. Product prices and availability are accurate as of 2019-04-22 07:36:21 UTC and are subject to change. Any price and availability information displayed on http://www.amazon.com/ at the time of purchase will apply to the purchase of this product. Integrated Plug System for PVC Decks and Trim The PRO PLUG® SYSTEM for PVC is a superior and easy to install plug system for PVC Decking and PVC Trim. It features the No Cam-Out PRO PLUG® PVC Tool, both stainless and epoxy coated star drive fasteners, and plugs made from actual deck and trim material. The System consists of two components, which are sold separately: (1) PRO PLUG® PVC DECK/TRIM KITS: Plugs are made from actual PVC decking or trim material, so they match perfectly. Screws are available in Stainless Steel or Epoxy Coated Carbon Steel. Both screws feature a star drive recess and are ACQ approved. 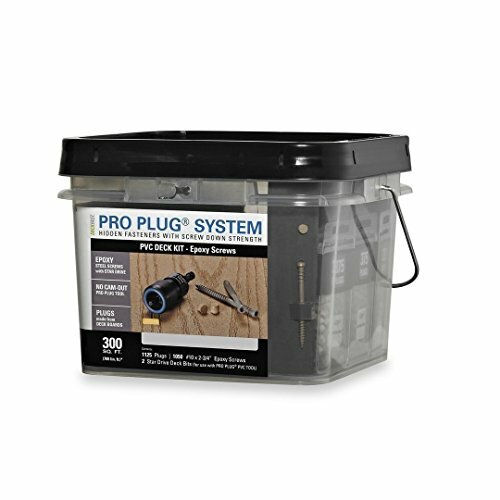 (2) PRO PLUG® PVC Tool: The Tool drives screws to the correct depth every time in deck and trim applications. It features a No Cam-Out Auto-StopTM mechanism that prevents the screw from stripping and a free spinning stop collar that protects the board surface. Kit Includes (1125) Plugs & (1050) Epoxy Coated 2-3/4 Plugs Made From Actual AZEK Decking for a Perfect Match No Pre-drilling Required! Quick and Easy Installation! 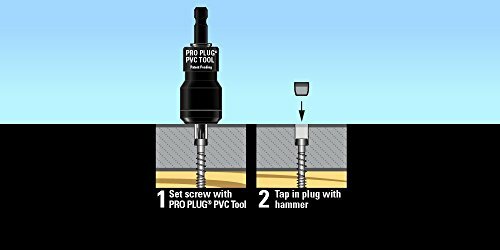 Required Pro Plug Tool for PVC now INCLUDED!